Spirit God give us faith. Spirit God give us faith. trust in one we can’t explain. greatest gift we can possess. During Lent, we often think about the wilderness that Jesus experienced when he was tempted. We too experience the wilderness in our lives; the times that we question our faith; when we are tempted and give into temptation; at the loss of loved ones and relationships; or when we are not understood or appreciated. The focus of this hymn by Mary Nelson Keithahn is on faith. A faith that helps us through a dark night. A faith that gives us strength to endure illness or pain. A faith that under-girds our journeys of witness and service. A faith that gives us courage and confidence in the midst of hopelessness and fear. How was your faith a blessing or a burden? What can you do during the remaining days of Lent to increase your faith so that the Way of Jesus leads you through the wilderness? Read this hymn again. What images or experiences do each stanza being to mind and why? As you reflect on this hymn, make it your prayer and ask God for an increased faith that is patient, trusting, steadfast, and full of courage. 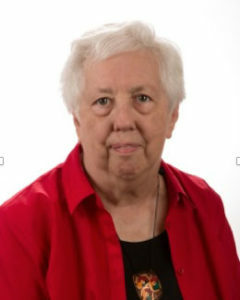 Mary Nelson Keithahn is a minister in the United Church of Christ in South Dakota. She has published several collections of hymns and written numerous articles for religious and educational publications. Her hymns are biblically based and express the faith in a fresh, challenging, and theologically sound manner.